Did you know that the dining environment (plateware, glassware, cutlery, sound, lighting, the amount of clutter, etc.) can influence how much we eat and how we experience a meal? External cues can be very powerful, even when we are unaware. Matching the color of the tablecloth with the color of your dishes made people take smaller portions. People who were served food on a red plate and drinks in a red cup cut calorie consumption by 40 percent. Even having chocolate on the plate did not change results. Foods tend to be perceived as more enjoyable when eaten with heavier utensils, and also people who use bigger forks eat less. People tend to drink more from short, wide glasses as compared to tall, narrow glasses. Researchers also say that eating from a bowl with a rounded bottom can make you feel full when eating less. And eating from a bowl allows us to bring the meal closer to us for a more intimate experience. We can feel the comforting warmth of the curved bottom as we take in more of the delicious aroma. The multiple compartments in a bento box can help us be aware of and control portion sizes. They can also support eating a variety of nutritious foods. And traditional bento practice is to make the box as beautiful and crave-worthy as possible, which is great for creating a delicious experience. Scientists find that composing food to be artful and visually appealing can actually make it taste better. Also, the first few bites are when we enjoy our food the most. After this, each additional bite becomes less flavorful as our palate experiences “sensory adaptation”—the reduced responsiveness of our sense receptors with ongoing exposure to a stimulus. Kind of like diminishing taste returns for each bite. What’s more, the final bite will determine our overall impression of a food and how much we enjoyed it. So if we eat fewer bites when the flavor is more potent, we can remember the food as more enjoyable, quitting while we are ahead. Which do you prefer? 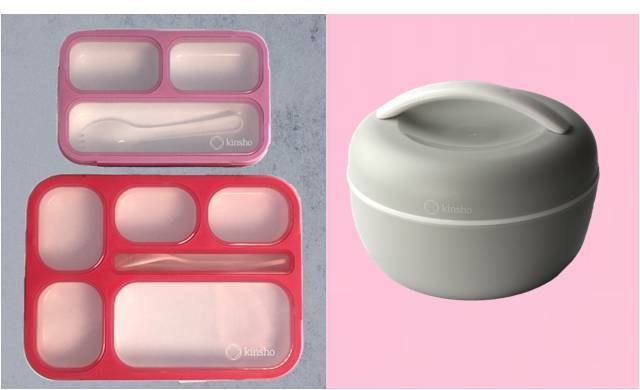 Try this – pay mindful attention to your mealtime experience when using our Bento Box and Bento Bowl for subsequent meals. Pack your lunch in a Bento Bowl one day and a Bento Box the next day. Sit down when you’re ready to eat. Undistract so you can focus on your meal. Screens down, laptop off! Take a few deep breaths before eating to calm your nervous system and become present. Tune into your senses for each bite. Look at, smell, listen to and fully taste your food. Chew a few extra times to get all the flavor and nutrients from each bite. Be curious about how the flavor changes. How does your desire for another bite actually feel? Can you notice when your palate begins to tire of one flavor and want another? Don’t rush. Put your fork down between bites. Notice if your thoughts are somewhere besides at the table. If so, take a breath and bring them back to your meal! Pause to notice your sense of hunger and satisfaction and how they evolve throughout the meal. Jot down any insights so you can compare to the next meal. Repeat with the other product the next day. You could repeat the same food or not. But pay equally close attention to the experience. What’s your kinsho? How did the experiences differ? What did you notice? Are you more of a bowl or box eater? Or might it be different for different types of food? Share your observations with us @kinshokitchen on Instagram or Facebook!